It relieves stress. Laughing helps to lower stress hormones in the body, helping to relax you. It lowers blood pressure. How? Because laughter improves blood flow, thus lowering blood pressure. It increases your immune response. Laughter increases antibodies and boosts immune cells, which fights illnesses and stress. It's a good workout. Laughing for 15 minutes straight burns 50 calories, working out your shoulders and diaphragm. It reduces pain. Laughing helps your body to produce natural painkillers, reducing muscle and joint pain. Just like laughing relieves stress, so does laughter yoga, but to a larger extent. Yoga by itself is a very relaxing exercise, but the two combined really reduces stress and tension. After you're done with a laughter yoga session, you'll find yourself way more calm and collected. A lot of people are uptight and stressed out. 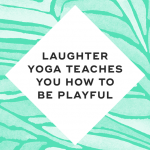 But laughter yoga teaches you how to let go and be more playful with others, including your partner and kids. Laughter yoga also teaches you how to be mindful, being able to be fully present in the moment. Laughter yoga makes you feel happier because your body doesn't know the difference between simulated and organic laughter. As a result, your body still releases endorphins and other "feel good" hormones, increasing your happiness. Phone laughter. Imagine you're holding a cell phone to your ears. Go through the motions and begin laughing. Slow laughter. Slowly start laughing by first giggling, and then gradually increase your tempo and volume until you're laughing hysterically. Hello laughter. Greet another person by shaking their hand, but instead of talking, start laughing. Sky laughter. Spread your arms up while looking up, and then laugh as deeply as you can for as long as you can. Plain laughter. Think of a funny situation, and just laugh until you can't laugh anymore. Laughter yoga has tons of emotional and health benefits, and it's super easy to do. Try out the above laughter yoga exercises and watch your stress instantly melt away. "20 Laughter Yoga Exercises," Active, n.d.
"6 Powerful Benefits of Laughter," Huffington Post, December 6, 2017. 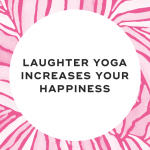 "I Tried Laughter Yoga and it Actually Made me Happier," Huffington Post, January 29, 2016. 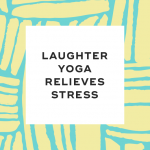 "Relieve Stress with Laughter Yoga," Yoga Journal, October 25, 2007.